You will be given a reference e-book to read which has 900 pages And the test will be based on that e-book , you can take final test within 1 year of purchase. In the computing industry, networking refers to the process of linking at least two computing devices together with an aim of sharing data. It is the process of building networks by combining computer hardware and software. Networks also come in various categories. One of these categories is that which defines the specific type of network used in accordance to the certain geographical area where it spans. An example of this is the local area network (LAN) which is capable of reaching across a single home. Wide area network (WAN) is also another example which is capable of reaching various states, cities and any other places within the world. The internet which is widely used at present is categorized as the largest public WAN all over the world. When it comes to networking, it should also be noted that networks come in various designs. Among the most popular ones are the client-server network which features more centralized server computers that are capable of storing web pages, applications, files and emails and peer-to-peer network which works by allowing all types of computers to support similar functions. If you want to become a certified professional in the field of networking, then it is advisable for you to study the major components of a network including computers, wiring and any other useful devices like switches, routers, hubs and network interface cards that are used in building a network infrastructure. If you want to learn more about networking, then you have to make sure that you consider enrolling in the networking certificationprogram offered by Brainmeasures since this certification course is one of the most comprehensive in the industry. The comprehensiveness of the networking course offered by Brainmeasures is extremely useful when it comes to understanding everything about building a network so becoming an expert in this field will no longer become that hard. Despite the fact that networking is a broad field, the experts in Brainmeasures tried their best to develop a program which can provide its participants with the most understandable and detailed networking training so the process of gathering relevant information about networking computers and the most complex areas in the field will become easier. It can offer you a stronger background about what makes up a good network infrastructure while also explaining in detail the specific devices that you need to build a more powerful and stable network. 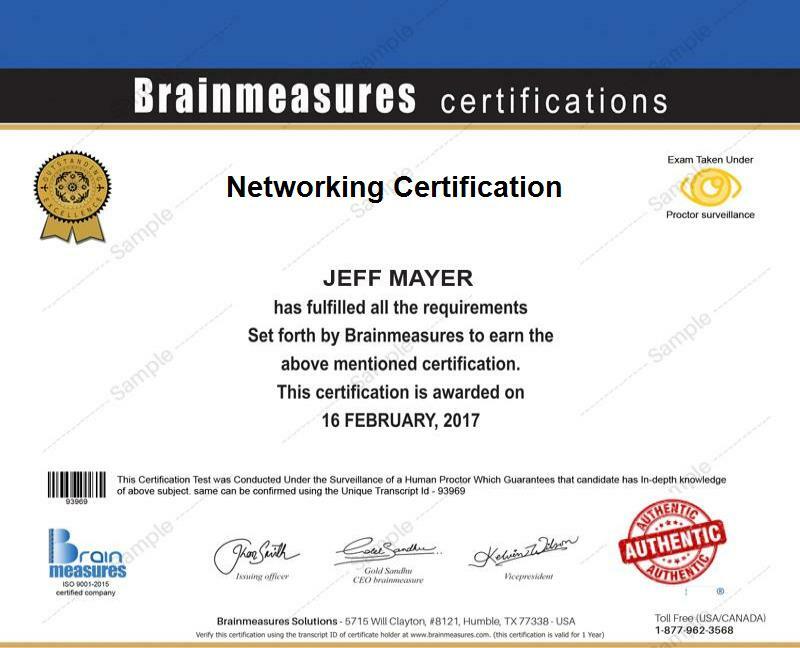 The networking certificate which you will receive after completing this certification course from Brainmeasures is something that you can boast of considering the fact that it indicates how knowledgeable and skillful you are in the field of networking. The networking certification program which is now accessible at Brainmeasures is a huge help to a wide range of professionals especially those who are working in the IT industry. It is most suitable for PC technicians, system administrators, networking professionals, computer engineering graduates and any other IT professionals who wish to increase their knowledge in the field of networking so they can start building a more stable and powerful network. Completing a networking certification course is also a major help when it comes to improving your stability when it comes to your finances. You can use your networking certification to get hired as a network support technician which offers a salary of around $61,000 to $75,000 annually. You can also work as a system networking administrator which allows you to earn around $78,000 to $108,000 per year. Working as a networking engineer is even more profitable since it allows you to receive an annual salary of $91,000 to $148,000.